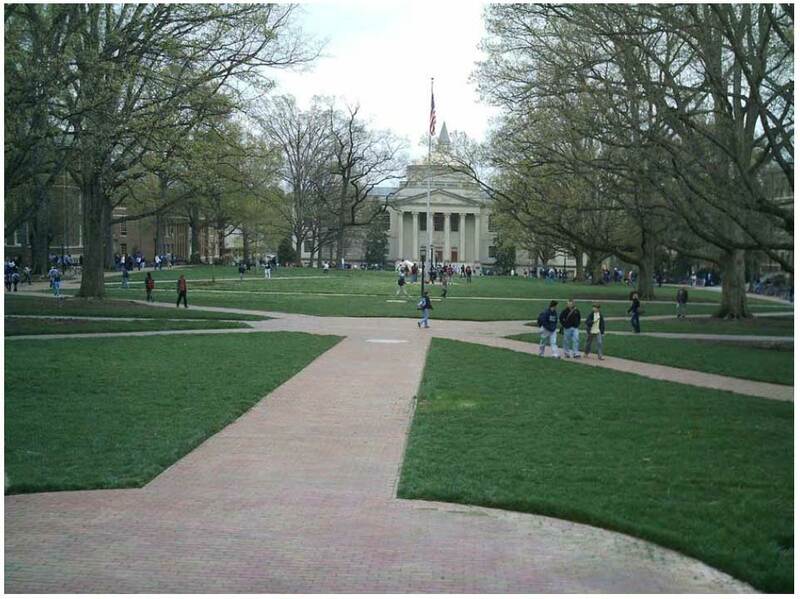 The University of North Carolina at Chapel Hill is undertaking an Historic Landscape Master Plan for the central portion of the campus. The following soils evaluation was undertaken to determine the limitation that soil may have on planting proposals and to help understand how soil quality has impacted previous plantings. The Study area is divided into four parts. McCorkle Place at the north end of the original campus, Polk Place, south of Cameron Ave, the Bell Tower formal garden. Kenan Stadium Woods, and the Forest Theater, which is east of the main portion of the campus. Each of the areas will be discussed separately. The evaluation was undertaken by observing ground conditions and the appearance of existing plantings, limited field probing using a soil auger and bulk density core tool, and interviews with campus grounds managers who are familiar with past soil disturbances and soil management. The observations and soil probing was undertaken on April 7th and 8th, 2008. Representative samples were taken and analyzed at A&L Soil Labs, Richmond, VA. Bulk density samples were processed and calculated at the office of Urban Trees + Soils, Annapolis, Maryland. Soil testing data from several sites in the study area prepared by the Bartlett Tree Expert Co in 2006 and 2007 was also utilized. McCorkle Place and other areas retain significant areas of undisturbed soil, which should be treated as an historic artifact of equal importance to other elements of the original landscape fabric of the campus. Soil preservation and protection is crucial for future tree and plant growth even in areas where there are no existing trees at present. Soil protection and management should be considered separately from other parts of the design and construction process. It should not be linked to tree preservation recommendations, which only look at the existing root system of the trees. All design projects should include a project specific soils analysis prior to the start of detailed design. The design process should respect the findings of this analysis. The stopping of forest succession by the removal or loss of seedling succession trees contributes to the ultimate decline of the forest and may be a significant factor in the decline of Kenan Stadium Woods.